According to the Mayo Clinic, almost half of all men and a third of all women in the United States will receive a cancer diagnosis at some time in their lives. It often comes with little warning, and while it may not be life-ending, it is certainly life-changing. If you should hear the “C” word from your doctor, what would you do next? One local resident shares her journey with the hopes of informing and inspiring others who may be facing this devastating diagnosis. 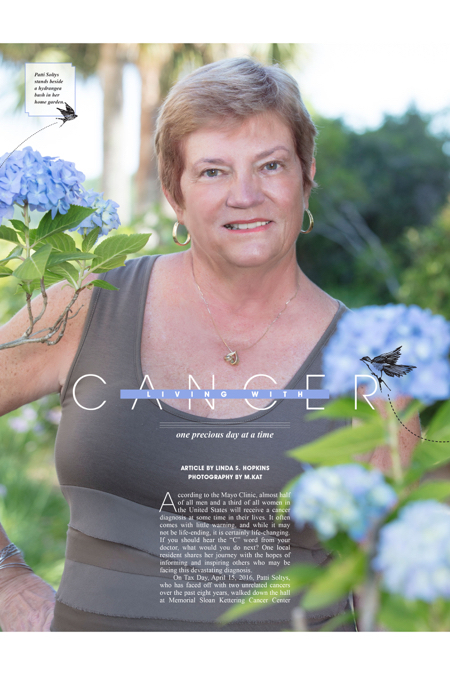 On Tax Day, April 15, 2016, Patti Soltys, who has faced off with two unrelated cancers over the past eight years, walked down the hall at Memorial Sloan Kettering Cancer Center in New York, IV pole in tow. Diagnosed with ovarian cancer and prepped for surgery to remove a dozen tumors from her abdomen, Soltys said being given the option to walk to the operating room (as opposed to being transported on a gurney or in a wheelchair) helped empower her. Followed by her entourage—her husband Bob, son Andrew, and a “nice looking man” who volunteered to push her pole the rest of the way to the OR—she headed into the unknown. If the cancer had gone too far, the surgeon had said he would sew her up without removing the tumors. “I remember turning back and looking over my shoulder. When I said goodbye to Andrew and Bob, I didn’t know if I was going to be operated on or how I would be coming back,” she said through tears. Cancer first knocked at Soltys’ door in September of 2010, just after she moved to Hilton Head Island from the Washington D.C. area. Before leaving, she had undergone all of her annual physical exams except for her mammogram, which she was not due for yet. New to the Lowcountry, in December, she went with a friend to Savannah to have the test, never expecting it to be anything but a routine screening. “People say mammograms don’t help that much, but in my case, it did. The radiologist saw a tiny speck that didn’t look right to her and biopsied it,” Soltys said. It was discovered that she had tumors in both breasts. After an exploratory surgery to determine if the cancer had spread to her lymph nodes (it had not), in January 2011, she underwent bi-lateral lumpectomies. After a successful surgery and a few weeks of recovery in New York, Soltys returned home to continue the battle for her life. Her surgeon coordinated her chemotherapy and follow-up care with an oncologist at MUSC in Charleston—a process lasting four months and requiring treatment every three weeks. • Keep up with screening exams. • Trust what your body says to you. Insist on further testing if you are not satisfied that your diagnosis is accurate. • Think big when it comes to doctors and hospitals. Go where they specialize in treating the kind of cancer you have. • Enlist family and/or friends to help you navigate the process. It’s tough to do it alone. • Advocate for yourself and ask lots of questions. Make sure you understand the diagnosis, treatment options, and procedures. • Set up or have a loved one organize a notebook to keep up with all the paperwork related to your illness and treatment—business cards, lab work, pathology reports, x-rays, etc. • Ask a loved one to establish a Caring Bridge site for you [caringbridge.org]. When you are going through this, there is no way you can keep in touch with everyone. A central place to communicate is helpful. • Consider an interim step rather than shaving off all your hair. Not everyone loses their hair, and some barbers or hairdressers are skilled at dealing with hair when you have cancer. Should you need a wig, the medical term for it is a cranial prosthetic. Many insurances cover it, just like other things you would need during an illness. The American Cancer Society has shops set up around the country that will ship you wigs to try on. They also offer classes on how to use scarves and jewelry to enhance your appearance (cancer.org/treatment/support-programs-and-services.html). • Stay ahead of pain and nausea. In regard to chemo, there are many pills involved. I tend to not be a pill-taker so deferred till I was really in tough shape. That, I learned, was a mistake. It’s far better to get ahead of it. • Pay attention to nutrition. White blood count can drop during chemo, and diet is important to keep up the count. It’s better to address this nutritionally than with pills. • Watch for dehydration. Between running to the bathroom and not being interested in food, it is easy to happen. • Exercise. It is empowering and also good to relieve stress. • Disclose at your discretion. Keep your diagnosis close until you personally feel ready. Some people on day-one want to talk about it. Some people never want to talk about it, and everywhere in between. I don’t think you know that until you go through it. But it’s best to err on the side of keeping it to yourself until you feel you are ready for the questions and the comments. Some people will say insensitive things, but most are well-meaning. • Don’t over-Google your diagnosis. You may not have all the symptoms or you may have a symptom that isn’t listed. You can make yourself crazy. • To the extent that you can, try to live your life as normally as you possibly can. • Accept that you can’t control it. I am such a control freak, and I do manage to control most things. This really set me back on my heels. • Turn to your faith. I try to do things to live my faith, because I’m not ‘religious’ in the holy scripture sense. But I was at peace with God’s will. If it’s my time, it’s my time. Once you accept that, you go to a whole different place. You’re not angry; you’re not frustrated; you’re not scared. • Make every day count; you have more warning than most. There’s an 80 percent chance that I will get cancer back, but there is some other percent that I will get hit by a beer truck or fall out of the sky in a plane or something else unknown. • Reach out to others for guidance. This ‘cancer club’ is much bigger than most of us know. A lot of people out there can be helpful. • Have the attitude of a snail. I see the little snails that work so hard digging through the sand on the beach. Half of them, at the end of the day, are right back where they started. But they get up the next day and they do it again. You have to have that kind of an attitude. You do the best you can. You have to be proud of it and celebrate that. You can’t give up. Having lived thru the experience I am in awe of the article. Linda captured the facts & emotions in a very smooth flowing, captivating, readable way. Great job!